There has been no shortage of discussion about what people think about public transportation service in Chelsea, but many of those conversations don’t always include the elderly, and that is one of the largest populations to use the service. On Monday morning, GreenRoots staff and a graduate student from Boston University gathered to speak to seniors in a multi-lingual, confidential discussion about what needs to be improved. The group was lively and many seniors turned out for the meeting. Some of the answers were unique to the older popular. Another request was to educate the young people and adults about getting up to provide a seat for an elderly person. “I hope the T can have an educational campaign to better let young people know that they are supposed to get up and provide a seat for an elderly or handicapped person,” said one man. By and large, though, the biggest complaint for seniors was the infrequent service and the inaccurate time schedule. There needs to be more places to get a Charlie Card in Chelsea. The MBTA needs to schedule a time to come to Chelsea to do photos for Senior ID Passes. There needs to be more regular 111 buses and fewer 111C buses. The Chelsea loop bus to the Mystic Mall needs to be more predictable, and it needs to also go to the Parkway Plaza. Prepare for a little color on the Chelsea Walk. But only if residents turn out to help paint the newfound oasis in the middle of the Broadway business district. GreenRoots and Chelsea artists Sylvia Lopez Chavez will host two Paint Days of the Walk on Friday, 11 a.m. to 4 p.m., and Saturday, 11 a.m. to 4 p.m.
“We hope everyone will join GreenRoots and artist Silvia Lopez Chavez to transform the Chelsea Walk into an area we will all be proud of,” said GreenRoots Director Roseann Bongiovanni. Phase II of the Walk transformation will begin later this summer with furniture and lighting installations, to be followed by Phase III consisting of art installations on the ceiling of the Chelsea Walk. Chelsea GreenRoots is leading the way in jump-starting a renewal of Chelsea-Eastie activism on the Chelsea Creek – sending out teams to help build up momentum on the Eastie side for Creek activism. GreenRoots Director Roseann Bongiovanni said the organization began trying to revitalize the interest in Eastie back in August after getting a grant to do some organizing. For many years, the former Chelsea GreenSpace and the Eastie Neighborhood of Affordable Housing (NOAH) combined efforts to form the Chelsea Creek Action Group – or CCAG. Together, that group fought of what they believed to be environmental threats to the Creek, including a power plant, CAD cells buried in the riverbed, and the Hess tank removal. 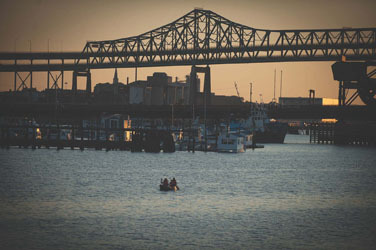 They also advocated successfully for the Urban Wild location on the Eastie side, and held social events like the River Revel. However, about two years ago, a lot of the leadership in Eastie shifted to other matters and concerns in the neighborhood, leaving Chelsea holding up one side of the Creek. Recently, though, Eastie’s Magdalena Ayed spun off environmental work in her organization HarborKeepers. That began to develop some interest again in the Creek activism in Eastie. This year, GreenRoots got a grant to do work to re-activate the grass roots base in East Boston and to institute Eastie leaders to begin leading the revived organization. First, they visited 12 groups, including the many neighborhood organizations in Eastie, and spread the word about trying to revive interest in Creek activism. Right now, John Walkey of Eastie and Indira Alfaro of GreenRoots are canvassing Eastie to get more people involved. Bongiovanni said getting both sides organized again is very important to the health of the Creek. She said there is also a great opportunity to learn from one another. “You see gentrification along the Creek a lot more in East Boston and we are hoping to learn from what they have gone through,” she said. Bongiovanni said the missing link on the Creek still is Revere, but she has hopes that some organizing can be done there as well. It’s a parking spot, or maybe it’s just a park. Chelsea GreenRoots unexpectedly opened up a Pop-Up Park at noon on Friday, Sept. 16, right in front of the Chelsea Chamber of Commerce in the heart of Broadway. The pop-up park was in honor of International Park(ing) Day and was a way to challenge residents to think about open space in the downtown area. The park was so popular that organizers had to keep it open an additional hour, until 5 p.m.